Hold up a mirror to Brad Pitt’s MONEYBALL, you get Clint Eastwood’s TROUBLE WITH THE CURVE. MONEYBALL (2011) told us the best way to draft major league baseball players is to study their stats on a computer and not rely on the disdainful opinions of crotchety old men. TROUBLE WITH THE CURVE tells us that despite the stats on a computer, you should rely on the disdainful opinions of crotchety old men. Eastwood is crotchety old baseball scout Gus (basically playing the same character from GRAN TORINO – that is, a retired Harry who doesn’t realize he ain’t Dirty no more), who is sent out by a league who is starting to doubt his skills, scouting a batter named Bo Gentry (Joe Massingill). His sight is failing, so his league manager and friend (John Goodman) appeals to Gus’s estranged lawyer daughter Mickey (Amy Adams) to accompany Gus on the trip, to help him out. As a young girl, Mickey was dragged around the country by Gus, viewing so many baseball games that she is quite the expert herself, with a love of the game that is belied by her bodily immersion in lawyering. On the trip, they meet fellow scout Johnny (Justin Timberlake), sent by the league to keep an eye on old Gus. Dumb, clichéd romance ensues between Johnny and Mickey (although we all know the more believable romance would have been between Timberlake and Clint, as all men are bound by God and Nature to worship Clint Eastwood). During their midnight swim, there is a sly baseball metaphor thrown in, as she tells Johnny to swim at a safe distance from her (because oh my gracious, how can a single girl trust the intentions of such a cad?). He swims closer and asks, “How’s this?” She replies, “Safe.” A little closer, “And this?” “Safe.” Just as we realize it’s a metaphor, we presume he’s stolen third base and sliding home. Underwater. I am also uneasy with Eastwood falling back on his curmudgeon character too easily. I wish he didn’t feel like he was trapped in it. For the sake of his man-legacy, it seems as if this is Clint’s version of a “strong” character these days, or at least an obligation to the fans of his younger avenger characters. At that age, how naïve and pointless would one look if one were not cynical and mean-spirited? What’s an aging avenger to do? We find that Gus’s meanness and his supposed “abandonment” of Mickey involve some wretchedly dark reasons. At one point, Gus says, “I’m just a broken down old man.” Wasn’t that Rourke’s exact line from THE WRESTLER? The subplot to humanize the curmudgeon – again, we see it coming a mile away. And of course, the young pitcher they do end up signing is a nice quiet Mexican boy who doesn’t even realize how fast he can throw, and never got the shot because he was poor and blah blah – straight out of Screenwriting For Dummies. TROUBLE is produced by Eastwood and directed by Robert Lorenz – and if you see many of Eastwood’s stylistic flourishes in this film, it’s because Lorenz has been Eastwood’s assistant director on innumerable Eastwood-directed films (ABSOLUTE POWER, TRUE CRIME, SPACE COWBOYS, including Oscar winner MILLION DOLLAR BABY). 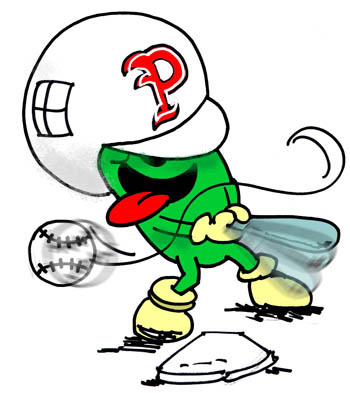 Just one last baseball analogy: TROUBLE comes at us straight across home plate – no curveballs at all, just flat, straight pitches with predictable characters in predictable situations; no interesting plot developments, no irony, no twists, no real callbacks or payoffs. Ironic that the movie itself has trouble with the curve. Starring: Clint Eastwood, Amy Adams, Bob Gunton, Jack Gilpin, Matthew Lillard, Robert Patrick, John Goodman, Justin Timberlake, Jay Galloway, Joe Massingill. The Elephant In The Room sits in an Empty Chair. Though Clint has always been at the top of his craft and on the cutting edge of his chosen profession, like every superstar who must lead a relatively insular existence, the Empty Chair speech made us realize with a shock that he is not in touch with current events as much as we’d like to think he is. 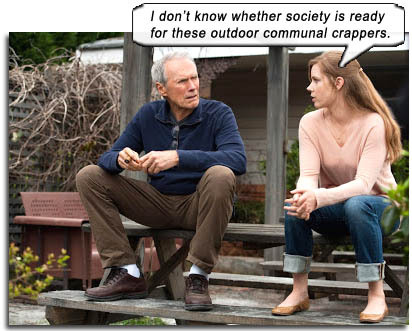 It’s hard to say and even harder to imagine – but Clint Eastwood is actually a Low Information Voter! One of those millions of lunks who vote “incorrectly,” that is, vote for a party because he THINKS that is what it stands for, rather than what it really stands for. Clint is pro-choice, Libertarian, pro-women’s rights and a vocal advocate of women as equals, he is for ending the wars, and in his chosen profession he advocates anti-war stances. But in his cringeworthy podium speech (albeit ad-libbed and played for laughs), he speaks to an empty chair placed beside him, telling us to imagine Obama sitting there – then proceeds to speak to the chair, misapprehending Mitt Romney’s stances on EVERYTHING. He vilified “Obama” for exactly all Mitt’s positions! For example [chastising the Empty Chair]: “I was disappointed you didn’t close GITMO” (yet Republicans continue to block Obama’s attempts to do so); “Mr. Romney asks ‘Why are you giving out an end-date for the war in Afghanistan? Why not bring them home tomorrow morning? '” (Romney’s policy was never to end any wars! ); Clint remarks it was a bad idea for an attorney to be president “because they’re always weighing both sides of the situation…” (Jaw-dropping ignorance from Our Hero! Isn’t that what every good leader should do? ); Clint remarks that it’s time for a “stellar businessman” to take over (not mentioning that Romney’s state of Massachusetts ranked 47th in the economy when he was governor; also not mentioning that if America was run like a business, then the bulk of red states should be fired for their ongoing deficits, as opposed to the bulk of blue states that continually show a profit). …And on it goes, Clint doing a better job than any Democrat in showing the world what a gaggle of waterheads the Republican party is for its incognizant APPLAUDING of everything wrong he said!